A decade ago, Android launched... to a world of challenges. But back in 2008, Google wasn't worried about artificial intelligence, it was just trying to make a stable mobile operating system. One that stood out in a very crowded playing field. Back then, the competition was Apple, BlackBerry, Nokia/Symbian, Palm and Windows Mobile. By 2009, however, Android's market share was steadily climbing, and by early 2010, sales inched past that of iOS devices (according to Statista). Android's upward trajectory hasn't stopped since. Now, Statista reports 88 percent of all smartphones sold run Google's mobile operating system, with iOS devices making up around 12 percent (based on total sales). What started as an alternative mobile experience for nerds has gone full mainstream. But what does that mean for the future of Android? Google's goals for Android look very, very different ten years on. Its biggest competitor in artificial intelligence isn't a rival smartphone maker -- it's Amazon. The e-commerce juggernaut isn't shy about its ambitions for the Alexa platform, opening it up to third parties and shoehorning the digital assistant into everything from microwaves and wall clocks to your car and home HiFi system. The more Alexa devices there are in people's homes, the bigger its footprint and training network for AI are. Android is no slouch in this area, though, it's just going about things a little differently. Google Assistant has rapidly become the backbone of everything on Android, thanks, in part, to the company's TensorFlow Lite -- a mobile version of its machine-learning API. Whether it's (creepily) making phone calls to set a dinner reservation or stitching together multiple exposures to make the best photo possible, Google's AI implementations just feel more exciting than Amazon's. Instead of it existing solely in the form of a digital assistant at your beck and call, Android uses AI for shortcuts like Smart Text Selection, which eliminates the need for copy and pasting text on a mobile device. 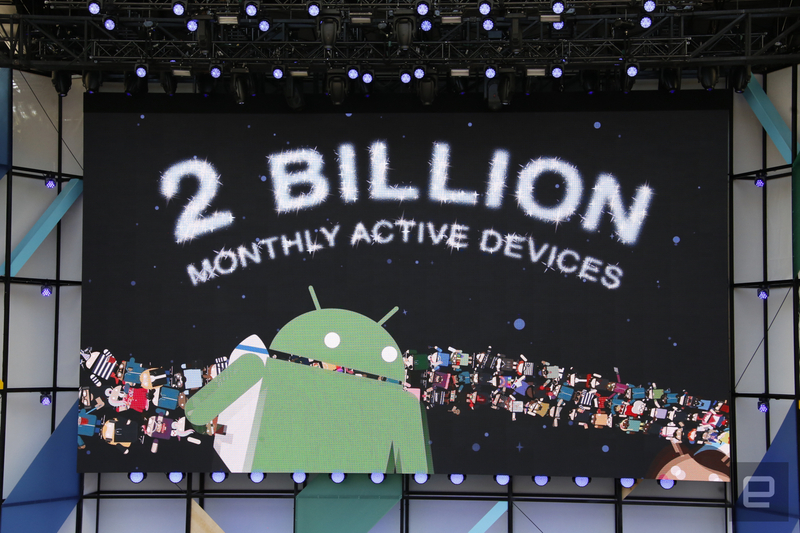 If the last few I/O keynotes are any indication, we shouldn't expect this to change in the future as more and more of Android's key components are powered by AI. Google's history with messaging apps is legendary, with Android having at least three of them in the past decade. The company has never been able to get one to stick, though, and none have stood toe to toe with Apple's iMessage platform. As such, text messaging on Android feels stuck in a bygone era where typing indicators and read receipts never happened. Chat could change that. It isn't just another app, Chat's built on top of the RCS (Rich Communications Services) protocol, the replacement for antiquated SMS texting. To truly compete with iMessage, Google will need to roll out a desktop messaging app and offer end-to-end encryption, not just offer support for group chats and animated stickers. We haven't seen evidence of a desktop app (but there is a Web version), but the latter has already, unfortunately, been ruled out. The success depends on getting enough carriers and hardware manufacturers on board. So far, Google has partnered with Samsung, T-Mobile and Sprint to push the standard's adoption. Apparently, there are over 50 carriers, almost a dozen hardware manufacturers and a pair of OS makers (Google and Microsoft) supporting RCS, but there are still notable absences from the likes of Apple, AT&T and Verizon. With the Pixel 3 announcement coming soon, maybe that won't be the case for much longer. Android One is not Android Go. The latter is a line of budget handsets designed for developing markets. The former requires a little more explanation. One of Android's biggest strengths (an open platform) is also a huge weakness. If you want pure Android, not a version skinned to look like whatever the third-party hardware maker decided, and free from bloatware, your options were limited for most of the last decade. The idea with Android One is to give customers confidence that the Android phone they're buying meets a certain set of standards, including security updates and a uniform interface. Google keeps a tighter leash on Android One than it does the Android Open Source Program, but unlike its internally developed Pixel devices, doesn't control every aspect of design. That gives manufacturers a little flexibility to adjust specs and features for different regions or to prioritize one aspect of the hardware over another. For you and me, Android One offers the promise of regular security and software updates straight from Google. Arguably, it's an extension of the Nexus line's legacy and Play Edition handsets of yore. All you have to do is look for the Android One badging, and you're good to go -- a stark contrast to the "will I?/won't I?" guessing game involved with updates for other Android-powered handsets. That strengthens the platform overall and ensures that more people have access to the latest and most secure version of Android possible. Google's first-party apps make up a bulk of the Android experience and serve as ambassadors for the platform on competing devices. The firm has pushed far beyond productivity apps like email and maps, and now it's hard to imagine a mobile world without Chrome, the Google Home app, Photos (right) or Authenticator being available, regardless of who makes your handset. In plenty of cases, like Assistant, Lens and Photos, they serve as a trojan horse for the company's AI initiatives. Every time you upload a batch of pictures to Photos, for instance, the neural network gets more training fodder. And while Apple may not allow Assistant or the main Google app the type of system access they enjoy on Android (that's Siri's territory), the applications still have a baseline level of functionality and work in concert with Google's other mobile tools. Mountain View's dreams for Google Glass may never have materialized, but the wearable's influence is indelible. Google is betting so hard on augmented reality being the next big thing that it designed its own software framework for the tech. That's in addition to making AR compatibility one of the core tenants of its most recent Pixel handsets. Google has plans for AR beyond fun and games. We're talking things like AR microscopes that use AI to analyze human cells and then point out which ones show signs of cancer. Or pointing your phone at a blank corner of your room to see how a new piece of furniture might fit before you try shimmying it through your front door. And then there's Lens, which analyzes what you're pointing your phone's camera at and overlays info you'd typically have to search for, or Visual Positioning System giving you accurate walking directions by overlaying navigation cues on the real world. It's a little clumsy at the moment, but as a window toward Google's ambitions, it works well enough. In 2018, Android not only looks far different than it did a decade ago but what it's capable of has shifted dramatically too, -- moving beyond phones and tablets to an operating system for your house, TV and connected vehicle. Google has overcome a number of the issues that plagued the software's early years, like relying on carriers to push out security updates, but artifacts from its past remain. Will Chat revolutionize text messaging? What are the next steps for Assistant? Will AR outlive Google Glass' shadow? Those are the questions Google will have to answer over the next ten years.